“I’d like to dedicate this to all the nematodes and hyperthermophilic bacteria who live in deep-water sulfide chimneys around the world,” says Mark, the narrator of Mark Leyner’s recent novel, “Gone With The Mind.” While the phrase may sound like the beginning of a scientific research paper, “Gone With The Mind” is far from academic discourse, exploring Mark’s childhood, the artistic process, and a variety of other topics ranging from extremophiles to the Oedipal complex. With its honest stream-of-consciousness style and humorous absurdity, “Gone With The Mind” may seem to be about nothing, but its many disjointed ideas combine to make it a unique exploration of the life of an artist and human being in the modern era. The premise of “Gone With the Mind” seems simple enough: The entire book takes place in a mall food court where Mark—called only by his first name—is giving a reading of his new novel. The plot involves almost no physical action, the story a journey of the mind rather than the body that features adventures through the landscape of memories, thoughts, and fears. In effect, the reading, with comments from Mark’s mother and the two uninterested food court workers, is essentially the novel itself. It would be impossible to understand Mark’s ramblings if it were not for his mother, Muriel, who conveys the tale of Mark’s childhood and roots Mark’s reading in reality. Her portion of the novel mostly relates small details of his youth, such as his love for books and his loss of a sister due to the incompetence of the doctors attending to his mother at the infant’s birth. Beyond this section, there is no plot, as Mark jumps from topic to topic in his exploration of interiority. For example, he easily jumps from talking about the difficult process of writing the novel in one section to discussing the meaning behind Twizzler or Mr. Potato Head commercials, but he manages to unite these concepts thematically. One such unifying motif is that of the Imaginary Intern. Mark nonchalantly mentions “how the Imaginary Intern was conjured up” from “the tiles on the bathroom floor… just staring at the vein patterns and at the craquelure on this one particular tile, and I discerned a legible face,” as if it were normal to create an imaginary being to talk to when one needs inspiration. From this point on Mark speaks about the Imaginary Intern as if he were a physical presence. The Imaginary Intern may seem like the delusion of a deranged man, but his presence in the novel provides a way to explore the artistic process in modern society. With the overbearing presence of the internet and distractions in the modern world, it is no longer possible for an artist to immerse himself in a work so as to completely avoid the outside. Rather, Mark uses his observations about the world, which are many times random and unconnected, to explore his own relation to the people and events around him. The Imaginary Intern’s input on what Mark should write reveals the strenuous process of using these different ideas to relay some sort of message and finding a means to use one’s talents to make something with purpose. While it may be an unorthodox way to explain art-making methods, Mark’s imaginary friend allows him to discuss the ways to connect his many thoughts and conveys how this is done right before the reader’s eyes, making this aspect of the novel both entertaining and instructional. However, perhaps the most powerful theme is that of the strength of the relationship between a mother and her son. Mark’s mother is the only other main speaker in the novel, and the majority of his childhood is composed of experiences shared with his mother. While he sometimes says things that appear unflattering, such as saying that his mom speeds when driving drunk or that the Oedipal complex should serve as the inspiration for their relationship, he ultimately reveals that he adores his mother with profound devotion: “There was a golden age for me when it was just my mother and myself, and this is still the idealized world I long for, still the mythic, primordial time.” As the novel demonstrates, there is nothing strange about Mark’s relationship with his mother. In reality, the book is a moving way for Mark to give tribute to his mother for her lasting impact in his life. 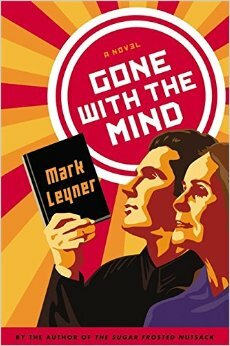 Beyond being an exploration of deeper ideas,“Gone With The Mind” is simply enjoyable: Leyner’s unique and at times grotesque humor lends the novel a light-hearted, interesting tone. For example, he often interjects his stories with a side reference to the actual state of the food court, with comments such as, “Mark clasps his hands to his heart and gives his MOM the most fervent look of esteem and affection one could possibly imagine” —which would not be strange if he had not just previously said, “How does it feel seeing your mother disappear with that lowlife scumbag who’s got his hand down her pants?” This strange, funny way of viewing the world keeps the book engaging as one tries to understand Mark, who is in turn trying to understand himself. “Gone With the Mind” does not make its depth obvious, and to find the more profound implications in this book, it is necessary to read into the way that the seemingly small things in life can give meaning to the world as a whole. Its complexity makes it satisfying—its deep thoughts emerging from a string of seemingly shallow statements or events. Although Franzen succeeds in rendering several exquisite passages and characters on a micro scale, “Purity” ultimately struggles to pack a punch on a macro scale, thanks in part to its lagging beginning. Oe expresses fear of "drowning" in both the physical decline of the characters and the stylistic deterioration of Choko’s own writing across most of the novel in an adroit move that risks losing momentum but, due to its expert handling, still succeeds.